This station is served by both BART and Amtrak. Amtrak platform is a block west of the BART platforms (halfway between Coliseum and BART). 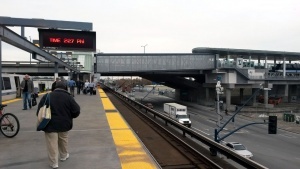 A pedestrian overpass connects these two platforms. This is a transfer point to Oakland International Airport via an automated shuttle train. Main BART platform and station entrance. From the parking lots on Hawley Street, use the pedestrian underpass to access the station. From the Coliseum complex and the Amtrak platform, use the pedestrian overpass to reach the BART station. This station features center platforms for main lines above the station concourse. Fare gates at Platform 3. Fares to and from Oakland Airport are collected here. Automated Coliseum - Oakland Airport trains depart from Platform 3. Riders transferring from other BART lines proceed to the south end of the main platform and enter Platform 3 via an overpass. At Platform 3, riders go through faregates (that's where airport fares are collected) before boarding the train to Oakland Airport. 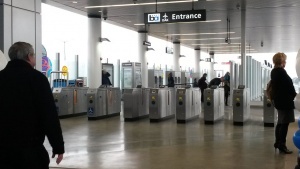 Riders from Oakland Airport pay fare at this station after exiting the train before transferring to other BART lines. Passengers riding Oakland Airport trains to or from this station (not transferring to other BART lines) need to purchase a BART ticket, enter the gates, walk through the main BART platform, and exit the other faregates at this station. There's no direct entrance to/from the street. The Amtrak platform is located on the west side of San Leandro Street. Capitol Corridor trains stop at this station. This station features a single platform. No ticket sales at this location. Parking for BART is located east of the station and Snell Street. 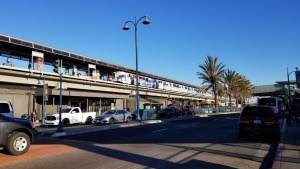 Parking for Amtrak (35 spots) is at the end of 73rd Ave west of San Leandro St.
To pay the daily parking fee, remember your space number, enter through the faregates into the paid area and pay at an add fare machine. This page was last edited on 12 December 2018, at 04:15.